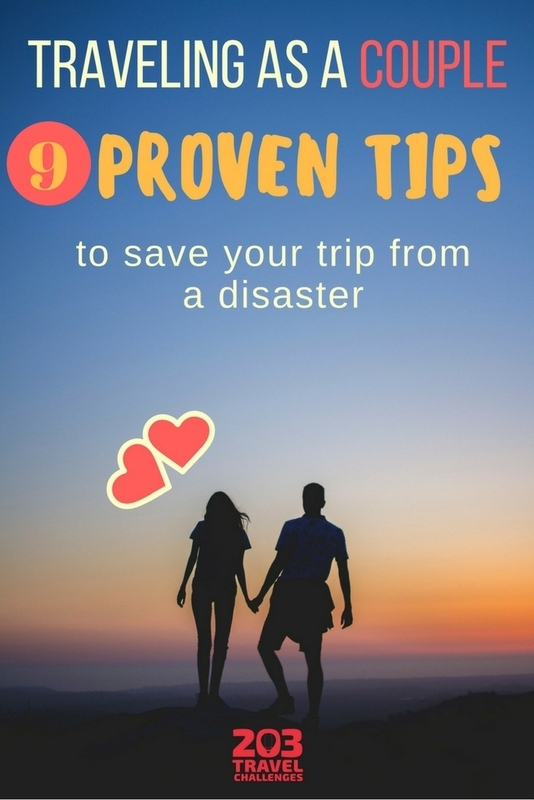 It’s not always easy to travel with your partner, but you can always source some wisdom from those who have discovered the little secrets of romantic travel. Unless the trip is a surprise, you should both make decisions about the destination, schedule, hotel and airline, etc. It’s a good strategy to share these tasks, so you both feel satisfied and important. It’s a common mistake to let your loved one do all the planning, while you are forced to ‘be happy’ with whatever comes your way. There’s nothing worse than setting foot in Uganda when you actually dreamed of checking for yourself whether Thailand is as crazy as you’d heard. I’ve been traveling with my guy for nearly two years now – he is English and I am American. It’s been a ride. I think one of the most helpful things you can do is to still go on dates. When you travel you are most likely going out to eat a lot and move around a lot, to the extent that it becomes a habit. So sometimes you don’t think about taking your partner out to a nice dinner that you plan out just for them. It’s important to go out of your way for the other person and still show them you care, rather than getting caught up in the moving around and the hustle of traveling. Regardless of whether they are friends, relatives or colleagues, if one of you doesn’t like them, don’t travel together with them! It’s even worse if during the whole trip you conform with those people and ignore your better half’s feelings. But the worst of all is if you insist on spending 100% of the time with those people without saving some special time for you two. If you follow this anti-guide, you will for sure end up with no boyfriend/girlfriend or even worse: with one who doesn’t want to travel with you ever again. It’s been proven that if you go on a vacation with nothing planned but beach and three meals a day, and you spend all of your time together, that’s a very, very bad idea. You will most probably have your first fight on the second day of your trip. Or at best, on the third. Spending 24 hours per day together with nothing interesting to do is the best recipe for an annoying and catastrophic romantic vacation. My number one tip for couples when travelling together as digital nomads or on holidays is that they should explore their own areas of interest or hobbies, and not try to do everything together. Allow yourselves some time alone. If one of you is shopping for souvenirs, let the other walk around and take photos or sit down for a snack. Arrange a meeting place and time. These small refreshing breaks will supply you with new stories to share with each other. If you love each other but you are incompatible as travelers, make a deal to take turns in making plans for the next day. Thus, both of you will have a truly versatile vacation and an opportunity to surprise the other with an activity they would not normally choose. I don’t mean to say that you’ll be bored by your partner, but every time my boyfriend and I (traveling together for three years now) meet other people, our trips reach a whole new level. Not only do you broaden your horizons, but you also make new friends, change the plan to meet them again on the road, go to their country to visit them… or at least that’s what we do. You should try it sometimes. It’s fun. Travel with no expectations; think of yourself as just two people taken out of their mundane life and placed in new, unknown surroundings, hand in hand. The French have a beautiful word for this: FLÂNER, to perceive life with all your senses alongside your loved one.